Whether you are a new or experienced .NET programmer, this book offers data management methods that you might frequently miss in the rush to complete projects on time. Author Deborah Kurata writes a handy, complete guide to lead you through hidden features and tricks buried within Visual Studio. 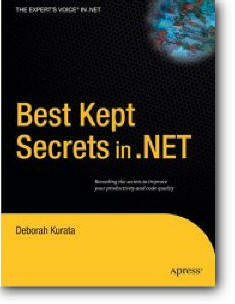 The book focuses on daily code management, rather than deep .NET framework discussions. Kurata concentrates on efficiencies, presentation, controls, data management methods, and day-to-day code snags. So if you’ve developed inefficient habits or have been fighting the development environment, you will, mercifully, save hours in the team development cycle by putting the book's tips into practice.